A proposal to build a new tar sands pipeline from Alberta to the US Mid-West has sparked heated debate from environmentalists. 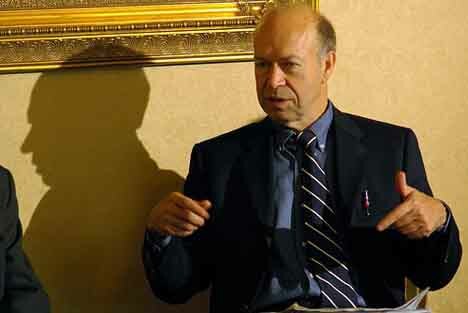 Among those in objection is James Hansen, famed climatologist and head of the NASA Goddard Institute for Space Studies. In a recent essay regarding the new Keystone XL pipeline, Hansen slams the tar sands for their environmental impacts (78KB PDF download). He draws attention to the increasing deforestation of the Boreal forest, the destruction of wetlands, the disruption of animal life cycles, fish deformities, but most importantly, the increasing greenhouse gases tar sands add to the atmosphere. Hansen accepts that humanity will continue to extract conventional oil from the ground. But if we continue to increase our oil consumption by exploiting non-conventional forms of oil such as the tar sands, we are setting ourselves up for a vastly different future. These are strong words coming from some of the world’s leading climate scientists. But why should we take their word for it? Well, Hansen has been exactly correct in the past. Thirty years ago, Hansen was the lead author on a paper published in Science entitled “Climate Impact of Increasing Atmospheric Carbon Dioxide” where it was revealed that global temperatures rose 0.2°C between the 1960 and 1980s. They further suggested this warming trend would continue as a result of human induced carbon-dioxide emissions, leading to (among other things) a rise in sea levels and subsequent opening up of the Northwest Passage. History has not proven them wrong so far. Global temperatures have risen substantially since the 1980s, global sea levels continue to rise, and the Northwest Passage melted so much that a cruise ship was able to successfully navigate across it in 2010 for the first time. Humanity needs to draw a line in the sand now when it comes to the extraction of non-conventional forms of oil. Pursuing fossil fuels such as the tar sands will only further entrench humanity in unsustainable forms of energy consumption, thus putting us on course for a less habitable planet due to global warming. Given the present course humanity has taken so far, I’m not too optimistic. We would need some serious changes now in order to avert a dire future. But what are your thoughts? Is there reason to be optimistic for our future given the current trajectory of fossil fuel consumption?